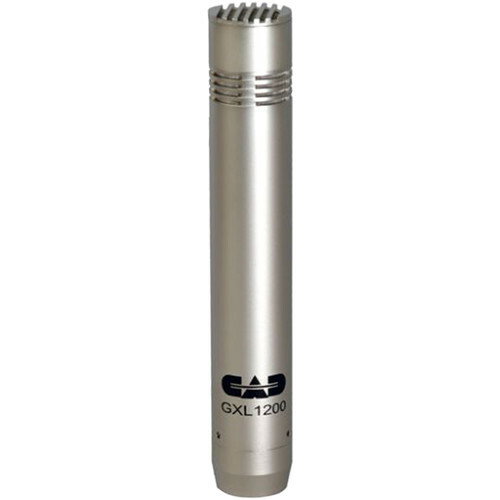 The GXL1200 Cardioid Condenser Microphone from CAD features a small diaphragm condenser configuration with a cardioid pattern for minimizing noise, ambiance, and feedback. It is designed for general instrument pick up and can also be used with vocals. There is a high SPL handling, enabling loud audio signals to be reproduced without noise or distortion. The GLX1200 is housed in a slim profile enclosure for spot capturing vocals and instruments such as guitar, strings, wood winds, overheads, cymbals, and percussion. The package includes a microphone clip and a protective pouch. High sensitivity, linear frequency response, and high SPL handling allow the microphone to be used in most recording or sound reinforcement applications. Box Dimensions (LxWxH) 7.9 x 3.8 x 2.2"
GXL1200 Cardioid Condenser Microphone is rated 4.5 out of 5 by 4. Rated 4 out of 5 by Michael from Beautiful sound. I use this mic for recording voice overs for my video productions. When I did my first recording with the microphone, I was amazed by how clear the subject sounded. Also, when I turned the gain all the way up, I could also hear the water running through my floor, my parents coming up the stairs, and the dogs who were on the opposite side of the house. Needless to say, this microphone sounds amazing and has a capability for detail that I have never had before. One problem. Phantom power. I cannot use it with my camera. Rated 5 out of 5 by Anonymous from Great mic I love the clarity and low noise in this mic. I use it for not only recording acoustic guitar and ukulele but I also use it for foley and sound effect recording out in the field for video. Great mic for the price. Rated 4 out of 5 by tuba ted from nice detail mic this mic is good for drum overheads and brass. when used with the KBM 412 you have a simple drum kit that is easy to set up. the low self noise lends itself to acoustic recording. Rated 5 out of 5 by @ from Good Microphone, by cad! I'm not a pro audio tech..yet..I specialize in video. But these mics are great so far for a simple and cheap solution and are performing well in tests.